Home / Unlabelled / WHAT SHOULD AN ISLAMIC WEDDING CEREMONY BE LIKE? 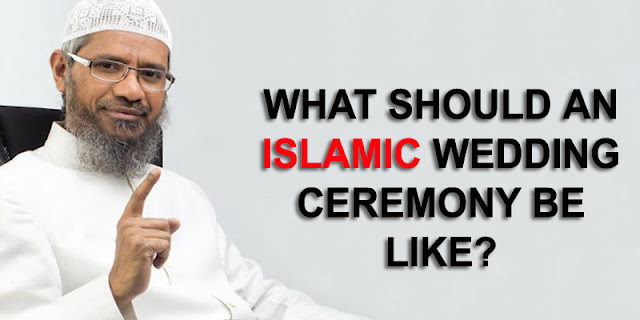 WHAT SHOULD AN ISLAMIC WEDDING CEREMONY BE LIKE? Allah Almighty created men and women as company for one another, and so that they can become parents and live in peace and calmness according to the commandments of Allah Almighty.In Islam marriage being an obligatory act is so important that it is declared to be one half of single Muslim’s faith. We can also say that Marriage Half Deen of Muslims. With regard to the woman: going to a male, non-mahram hairdresser to have her hair done; or adorning herself in ways that are haraam, such as thinning the eyebrows by plucking them, or wearing tattoos, or wearing hair extensions, or other kinds of haraam things, because the Prophet (peace and blessings of Allah be upon him) cursed the one who plucks eyebrows and the one who has that done, the one who adds hair extensions and the one who asks to have that done; imitating the kuffaar in their dress, because usually the wedding dress shows many of the woman's charms and her body, in such a way that the dress is very revealing - we seek refuge with Allah – and also a great deal of money is wasted on the dress. Among the haraam actions that have to do with the man are: shaving his beard for the wedding night, which is done on the grounds that this makes him look more handsome, but this is something which is haraam according to sharee’ah; letting one's clothes hang below the ankle (isbaal). 1- Mixing of men with women, and things that are involved in that, such as greeting and shaking hands with one another, and men and women dancing together, because all of that is haraam and is a very serious matter. 2- Taking pictures, whether men do that amongst themselves or women do that amongst themselves. 3- Drinking alcohol or eating pork. 4- Letting the husband come in to where the women are in order to take his wife. 5- Women wearing revealing, tight or short clothes amongst themselves, because this is haraam – so how about wearing such things in front of men? 6- People should avoid spending extravagantly or going to extremes in showing off in wedding parties, because that may wipe out the blessing. 7- The husband and wife exchanging rings and thus imitating the kuffaar, thinking that this will increase the husband’s love for his wife and vice versa. Finally, both partners should know that the more the teachings of Islam are followed in the wedding ceremony, the more blessed their marriage will be, the more love and harmony there will be between them, and the less problems they will encounter in their married life. For if the married life is based from the outset on haraam things which go against the commands of Allah, how can they expect the marriage to be successful after that? There have been many marriages in which there were things that went against the commands of Allah, and they did not last. Fear Allah with regard to this party and keep it free of things that are forbidden in Islam. May Allah bless you all. We ask Allah to give us strength. May Allah bless our Prophet Muhammad.